Former BBC Everyman presenter Peter France used to scrutinize religion from the outside. Now the searcher has come inside. Here in seven 15-minute episodes he reveals his own remarkable journey to Christian faith. 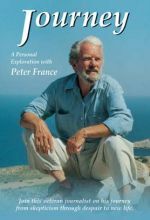 He takes us from his childhood in a Yorkshire mining village to a time of questioning, skeptism, desperation and planned suicide, from his search for and discover of the truth to his eventual baptism at age 57 on a Greek island.